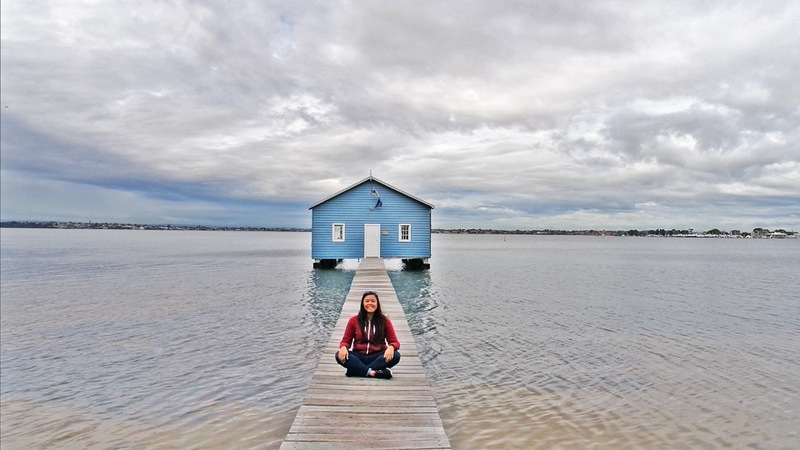 The Crawley Edge Boatshed (otherwise known as the Blue Boat House) was definitely on my list of places to visit while I was in Perth. My itinerary for the day included a walk through Kings Park and a stop by University of Western Australia, which was just a few minutes away from the boatshed and seeing how it was more of a chilled trip to finding myself, I wouldn't want to miss having my picture taken at such an iconic landmark. Situated right on Swan River, you will see it on the left while driving along Mounts Bay Road heading towards UWA. IF you are planning to head there via public transport, there are transperth buses that could get you there from Perth City, too. I took service number 950 and stopped a few metres away from the boarded walkway. Just so you know, there is no access into the boatshed. However, despite it simply being just a boatshed that is painted blue, it is the most photographed boatshed in Western Australia. Hence, try as much as possible to avoid coming here on the weekends, as the place is usually occupied with wedding photographers and future newlyweds getting their bridal shoot done. Unfortunately for me, the boarded walkway was cordoned off during my visit. At first I was assuming that it was because I visited during winter, when the air is obviously wet which could result in the wood absorbing moisture and in return, becoming soft and unsound. After some Google searches, I found out that the landmark will be undergoing some renovation works. I visited during winter in August and it was only cordoned off, not undergoing any works yet. However, according to this article, it is currently inaccessible to public. I was heartbroken and I felt like there was nothing I could do about it, so I sat on the steps in front of the signage for at least twenty minutes appreciating the beautiful view of Swan River. It was truly captivating, but at the same time, I felt like I was having a battle in my head. As I was standing at the edge and snapping shots of the landmark from a far, I realized how wrong I was. There is something I can do in this situation and it's either to break some rules or simply move on to the next itinerary on my list. I chose the former. I got my picture after all. The wood was extremely soft and squishy. I admit, it is dangerous and I apologize if it affects you in any way. But it was my birthday and it was all in a spur of a moment where I just went, "F it. I did not travel all the way here to be left at the edge. I can swim anyway," and walked towards the middle. My friends were all shocked but I remembered why I took this trip and reminded myself of who I was back when I was younger. I used to be so adventurous and taking every risk. I had lost my identity along the way and it had been a long time since I did anything worth remembering. Thank you Perth, you are beautiful. I will be back.